In the Main Toolbar, click Email. From the Email Inbox (reply to and compose emails). From a Patient Forms by clicking Email. From the Treatment Plan Module by clicking Email TP. Provide a EHR Summaries of Care by clicking by Email. When sending, the window is in compose mode. The Sent/Received status will be Neither and the Date/Time will be Unsent. From: Defaults to the default email address in Email Setup or the logged-on user's email (if set up, see Email Address Edit). Click the button to open a window listing all email address options for this user. Double-click an address to select, or highlight and click OK.
Alternatively, enter an email address and alias manually (e.g. If bob@gmail.com is selected in the dropdown, and Sparkly Dental <bob@gmail.com> is entered, the recipient will see Sparkly Dental instead of bob@gmail.com). Note: Email addresses tied to digital signatures cannot be edited. To: Defaults to the patient's email address on file. If you begin typing a new email, a recommended contact list will populate. You can select from the list, or continue typing the address. CC (carbon copy): Enter email addresses that will receive a copy of the message. Blank by default. BCC (blind carbon copy): Enter email addresses that will be sent a copy of the message, but who will not show as a recipient on any other recipient's email copy. Blank by default. Signed By: Only shows if encrypted email has been set up on the local computer for the From email address. Click Sig to see details (see Digital Signatures below). Body: The message text. If an Email Autograph is associated with the From address, it is inserted by default. If the autograph is associated to multiple email addresses, the autograph listed first is inserted. To insert an Email Template, select it and click Insert. The template's subject and message will replace any existing text (including autographs) and associated attachments will be added. To insert an email autograph, select it and click Insert. The autograph will automatically insert at the end of the email body text. To edit the message using basic plain text click Edit Text. To edit the message using HTML coding (for images, fonts, etc.) click Edit HTML. See HTML Email for more information. Note: If you have edited a message using Edit HTML, clicking the Edit Text button will switch to using plain text formatting. However, the HTML tags will not be stripped from the message automatically and you may need to delete them before sending. All messages are permanently saved. They can be viewed in the Email Inbox, Sent Messages tab, and in the Account and Chart modules. Delete: Delete a sent email from Open Dental. It will remain on the mail server, but will not download again. 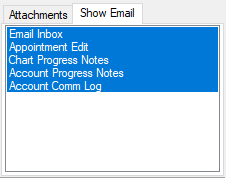 Emails attached to a patient, once deleted, are removed from the Sent Messages tab, yet still visible in the Commlog and Progress Notes. Emails not attached to a patient are permanently removed. Save: Save an email without sending. Saved emails are attached to a patient list in the Chart module and Commlog. If Open Dental shuts down unexpectedly, emails that are in progress are automatically saved. Direct Message: Sends an Encrypted Email. (see Email Encryption Options) Regular email is not a secure method of sending PHI. Encrypted email must set up for the sender and the recipient must be a trusted source. If you experience issues sending encrypted email, it can be a permission issue. Try running Open Dental as an administrator. Send: Immediately sends an unencrypted message. Attach files to the email. Click + to add an attachment. You will be prompted to locate and select the file. If images and documents are stored in a local or network folder (see Data Paths Setup), a list of all images in the selected patient's A to Z folder on the local or network folder will display first. Locate the file and click Open to select it. If images and documents are stored in Dropbox, a Select Files window will open listing all images in the selected patient's Dropbox A to Z folder. Double click a file to select it, or highlight it and click OK.
Click the right arrow to refresh the list. Click Preview to view a selected file on-screen. Click Select Local File to search for the file on the local drive. 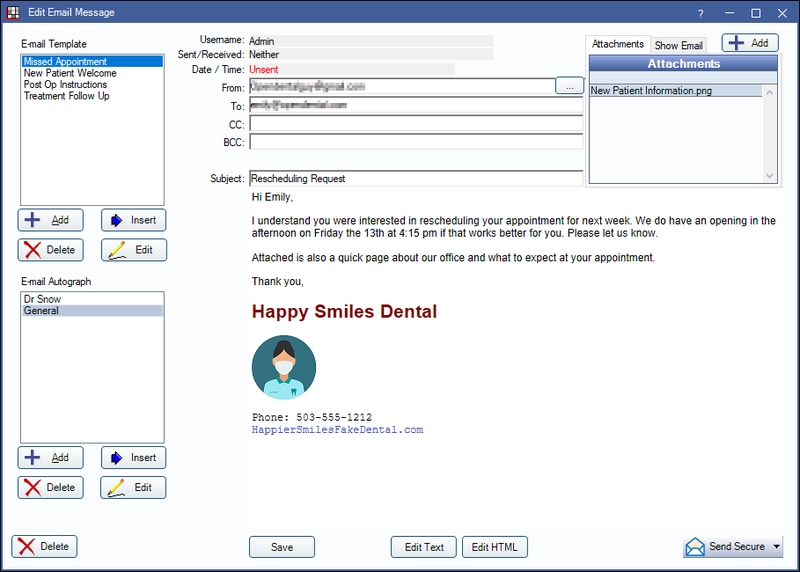 Select where in Open Dental an individual email will show or not show. To show the email in an area, highlight it. To hide the email in the area, deselect it. By default, all areas are selected. To view emails that have been hidden in all areas, go to the Email Inbox. When sending encrypted email, a digital signature is sent with the message. To view signature details, click Sig.